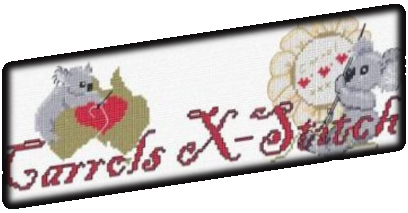 Hi everyone and welcome to my Australian Cross Stitch Designs! I began with Aussie Christmas designs because they were hard to come by and have since added many more categories including the popular baby birth sampler range. Here you will also find a wide variety of designs for many occasions in sizes suitable for ornaments, cards and wall hangings. You can now find a selection of my designs at Crafty Frog in Canberra. ItchyStitchy.com.au is an Aussie site with discount DMC thread packets corresponding to some of my charts. I have been asked to provide the stitch counts on designs.